Are you at your wits end? Completely frustrated and stressed out over your child’s behavior? Are you questioning where the child you raised with values went? It is time to empower yourself with information that can help you take control again. So many parents are desperate to find resolution and peace with their out of control teen. They feel helpless, hopeless, scared, exhausted, and bewildered where this behavior came from. Many teens are suffering with low self esteem, depression and other negative feelings that are making the act out in defiant ways. For more information on Teen Depression, please visit www.suescheff.org. It is important to try to resolve these feelings before they escalate to worse behavior, including substance abuse and addiction, sexual promiscuity, eating disorders, self injury, gang involvement, etc. These teens are usually very intelligent and capable of getting Honor Roll grades, however are not working up to their potential and lack the motivation to succeed and do well. This can stem from peer pressure combined with the teen’s feelings of low self worth. It is one of the most common trends today – highly intelligent teens making bad choices. Are you telling yourself; “This is not my child,” yet soon realize that it is and you must take control of an obvious out of control situation. As a parent that has experienced and survived a troubled teen – I am introducing “Parent Empowerment” to help you take control of your family again. My goal is that you will learn from my mistakes and gain from my knowledge. Do you think you are alone? I can assure you, that there are many parents that are in your same situation – and feeling the same frustrations. Remove privileges or place restrictions on cell phones, televisions, computers, going out on weekends, friends, phone time at home, etc. In today’s society, although these should be privileges, most are considered normal necessities of a teen’s life. This can be related to entitlement issues. Click Here Many instances even if you have removed the privileges, the child knows he/she will eventually get them back, and find other means to communicate with their teen world. Change schools – How many times have we believed if we change the school the problems will go away? Maybe in some cases, however these issues will follow your child into the next school environment. The problems may be masked in the beginning, but in most cases, the trouble will soon arise again. Changing schools, although may temporarily resolve some problems; it is rarely the answer when teens are emotionally struggling. Have your child go live with a relative out of state? Wow, this is very common, but the other similarity is that in many situations it is a short term resolution before the family is calling and saying they can’t do it any longer – you need to find another alternative for the teen. This can be traumatic and stressful for both families involved and cause friction that could result in more negative feelings. How many families have actually moved? Believe or not, parents have looked for job transfers or other avenues to try to remove their teen from the environment they are currently in. So many of us believe it is the friends, which it could be, however as parents we need to also take accountability – this is not saying we are to blame, but we need to understand that our children are usually not the “angels” we believe they are. Sure they are athletic, played varsity sports (football, track, golf, swim team, dance etc. ), musically gifted, or other special talents as well as were in all advanced placement classes – but reality is, if you are reading this, this has changed. Seeking a therapist will help. Yes in some cases it will. And of course, we should all try this avenue first. Unfortunately more times than not, the teens are already a master manipulator and can breeze through these sessions convincing the therapist the parents are the problem. I know many of you have probably already experienced this. The other concern with therapy is that in many situations the one hour once or twice a week can barely scratch the surface of what a family with a troubled teen may require. Was your child arrested? If your child has committed a crime, chances are they will be arrested. If your child has become belligerent in the home and you fear for your safety or the safety of your family, again chances are they will be arrested. In some cases with first time offenders the charges could be dropped. However if this becoming a chronic problem, you seriously should consider outside help. When a teen is arrested and placed in a juvenile detention center, even for one night, they are exposed to a different element that could either scare him/her or harden them. Teens can learn bad habits in these centers, or potentially worse, make friends with teens that have far worse problems than yours. Scared Straight Programs or Boot Camps – Are they effective? Many parents will seek a local weekend Scared Straight Program or Boot Camp. In some cases, it may have a positive effect on your teen – a wake up call so to speak; however in other cases it may worsen your problem. Depending on your child and the problems you are dealing with or how long they have been going on, may help you to determine if these types of programs would be beneficial or detrimental to them. Some teens will leave a Boot Camp or weekend Scared Straight program with more anger and resentment than when they entered it. The resentment is usually directed at the person that placed them there – not at the program. This can open doors to more destructive behavior. Personally, I am not in favor of Boot Camps or Scared Straight Weekend programs. A visit to a jail with a police officer, giving the teen the awareness of what could happen to them, may be a better way to help the teen to understand consequences of the current behavior. These above efforts are avenues parents could try before considering any type of boarding school program. I believe exhausting all your local resources should be the first path. Making a decision to place a child outside of the home is a major decision and one that is not to be taken lightly. It is important you educate yourself – empower yourself with information to help you make the best decision for your child. Click here for a list of questions to ask schools and programs in order to determine if they are a fit for your teen. Helpful Hints when searching for schools and programs. An educated parent is an empowered parent. Parent Empowerment! Take control of your family life again. It is finally here – summer. Whether your kids are going to summer camp, visiting their grandparents or other family members or visiting friends for an extended time, be sure they are emotionally ready. Parenting Expert and author, Dr. Michele Borba, has done the research on easing your child into their summer sleep away experience. Here are some research-based pointers to help your child–and you–have a fun time and great memories. Be sure your kid is ready. Is your child sleeping in her own bed through the night or is she climbing in with you at two o’clock in the morning? Does she have any problems separating from you when she goes to school, the baby-sitters, or day care? Does your child get along with this kid well enough to spend a whole night together? Does she feel comfortable with the child’s parents? If not, forget sending her away to that pricey two-week camp. Chances are she won’t make it through day one. Hint: A survey conducted by Sesame Street found that most parents say children are old enough to spend the night at around the age of seven. Do keep in mind that the age is not set in stone: it all depends on the child and you are the one who knows your child best. Do a practice. For a reluctant child, have the first sleepover be at your home. It sometimes helps if your child uses the same “security items” (for a real sleepover at your home first. Or try having your child spend the night with Grandma and Grandpa or a special cousin. Find a buddy. Any buddy!!! Research says kids always feel more secure away from home if they know at least one other child. It could be a child she knows from her hometown (and she doesn’t have to be best friends with the kid), or ask the camp counselor to give you an email address or phone number of a similar-aged child as yours. Maybe they can connect before you drop her off. Pack a few “security items.” A few packed items can make even the most anxious kid more comfortable. For instance: a flashlight if she fears the dark or staying in a strange house; a granola bar or sandwich (in case they “hate” the meal); a sleeping bag with a rubber sheet tucked inside might help a bed wetter feel more comfortable just in case he has an accident; their own pillow or blanket; even a cell phone for reassurance that she can call you anytime if really needed. Think of what might make your child feel safer. Better yet, have your child think up what he needs to feel more at home. Meet the counselors or parents. No matter how old your child is, do meet the camp counselors or parents face to face. You want to be sure they will be supervising the whole night, have your phone number handy, and clarify that if there are any problems you want to be called. Show off the activities. Other than finding one buddy to “hang with” the next thing researchers say what alleviates homesickness is involvement in an activity (tennis, crafts, kayaking, swimming, beading…anything). If you can get your child excited about one activity he will be more likely to feel a little more comfortable. And he’ll have something to look forward to doing. Breathe when the phone call comes. Homesickness is normal. It is far more prevalent with younger kids and those who have never been away from home. It is also common with college-aged kids. So don’t go thinking your child is not adjusted if you get that “MOMM!!! I hate it here!” call. Instead, listen. Just listen. Telling her to get over it, or it will get better, doesn’t seem to work (says the research again). Don’t promise you’ll call her 50 times a day either. Bad move again says researchers. You can tell her to call again tomorrow. Listen to the tone in her voice. Talk to the camp counselor (without her knowing). And then make your decision (can she wait it out – or it is better to pick her up) based on your child. Downplay failure. So what if your kid doesn’t make it all through the night? If you want this to work in the long run, emphasize the positive accomplishment. “You stayed there two hours past your bedtime. That was much longer than last time.” “It’s not a big deal. You’ll have lots of opportunities to spend the night at friends’ houses again.” There’s always next year! This research is an example of the vast amount of parenting information Dr. Michele Borba has compiled in her Big Book of Parenting Solutions. If you don’t have a copy of it, be sure to pick one up or order one on Amazon today. It also makes the perfect baby shower gift, it is a library of everything you need to know about parenting and more! Watch video introduction to Michele Borba and get a sneak peek inside her biggest book to date! On the last half of 101 topics that are discussed in The BIG Book of Parenting Solutions, Michele Borba will delve into the social scene and school. If you missed the sneak peek series, go back and read about what this massive book has to offer. The final quarter – Special Needs and Day to Day parenting. Resolution Reminder: Parenting 2010 – Getting ten steps ahead of your kids with technology. Watch the short video and get an inside look at this BIG Book and how it will help you help your kids! Be a smarter parent in 2010! Over the past weeks I have brought you inside one of the largest parenting books on the market, BIG Book of Parenting Solutions written by parenting expert, Dr. Michele Borba. As the holidays are approaching, if you have any parents, parents-to-be, educators, daycare providers, therapists or anyone working with today’s children on your holiday gift list, you can’t go wrong with BIG Book of Parenting Solutions. Are you attending a baby shower? This is the manual the hospital should give out when your child is born. Thanks to Wiley Publishers, they have offered you an inside peek at the actual pages! I have given you sneak peeks of the educational information, now you can see on this slide show exactly how much more there is to this cookbook of recipes targeted at parenting! As Part 3 continues in my series about Dr. Michele Borba’s Big Book of Parenting Solutions, we explore detrimental parenting styles. “Take a minute to review each style and be brutally honest. Might any of these be what you’re using as a parenting approach? If so, here is a crucial point to know: before you change your child, you must first change how you respond to your child. Might your parenting approach need altering first?” – Michele Borba. Here are the 7-deadly parenting styles with a brief header. You will have to order this book to find out the answers! That is what a sneak peek is. For every parent out there, this is a must have in your parenting library. If only they gave you this book out when your child was born, it could have saved us a lot of bumps and potholes. Next sneak peek: S-E-X, yes that dreaded parent/child conversation is here (page 394) – don’t miss this! For those that don’t have time to read, this is the perfect book for you since it is not the type of book you sit down to read. As parenting questions come up, you can go straight to the index and find the page number. Immediately you will see the pages divided by boxes, quick tips and advice and easy to read and understand resources. Did I mention she also gives you proven research and statistics? Order The BIG BOOK of Parenting Solutions today! Whether it is for yourself or as a gift, you won’t be disappointed. Click here for more articles on parenting. Don’t forget to subscribe to my latest articles, and you won’t miss the sneak peeks inside this valuable book as well as other great tips, resources and stories. As part of my continuing series of Dr. Michele Borba’s insights and sneak peeks inside her Big Book of Parenting Solutions, we will review signs and symptoms of an ungrateful child. This is Part (2). •Model gratitude. Kids learn by seeing others display appreciation in everyday, unplanned moments. 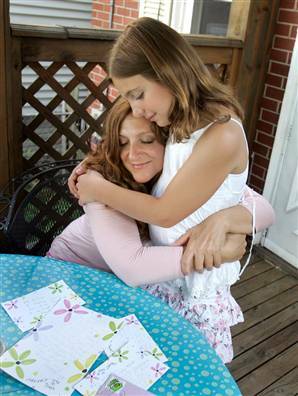 How often do your kids see you convey your appreciation with hugs, words, or small notes to others? (Much more on page 226 in Big Book of Parenting Solutions). •Set limits. Having too much “stuff” squelches appreciation. (Read more on page 226 in Big Book of Parenting Solutions). 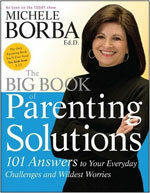 Michele Borba offers three more beneficial steps with much detail in her Big Book of Parenting Solutions. These are some sneak peeks and hopefully you will see the value in owning a book of this magnitude in your parenting library. Next sneak peek: The Seven Deadly Parenting Styles – don’t miss this! Dr. Michele Borba is getting ready to release her BIG BOOK of Parenting Solutions, and she is giving you a sneak peak of what you will find inside. I recently worked with PARENTS magazine to conduct an online survey of over 2400 moms. One question: “How do you hope your child turns out?” Next to health and happiness, most parents hoped their children would grow to be adults with solid character and strong morals. One thing is certain: parents who raise moral kids don’t do so by accident. We also know that home is the best school for teaching character. And the best time to teach the beliefs and habits that boost strong character are in everyday intentional moments. Here are ten tips to help you raise your child to have a strong moral intelligence from my new book, The Big Book of Parenting Solutions. How important is it for you to raise a moral child? It’s a crucial question to ask, because research finds that parents who feel strongly about their kids turning out morally usually succeed because they committed themselves to that effort. If you really want to raise a moral child, then make a personal commitment to raise one, and don’t stop until he does. Before you can raise a moral child, you must be clearly about what believe in. Take time to think through your values then share them regularly to your child explaining why you feel the way you do. After all, your child will be hearing endless messages that counter your beliefs, so it’s essential the she hears about your moral standards. TV shows, movies, newspapers, and literature are filled with moral issues, so use them as opportunities to discuss your beliefs with your child. The best teaching moments aren’t ones that are planned-they happen unexpectedly. Look for moral issues to talk about as they come up. Take advantage of those moments because they help your child develop solid moral beliefs that will help guide his behavior the rest of his life. Effective discipline ensures that the child not only recognizes why her behavior was wrong but also knows what to do to make it right next time. Using the right kind of questions helps kids expand their ability to take another person’s perspective and understand the consequences of their behavior. So help your child reflect: “Was that the right thing to do? What should I do next time?” That way your child learns from his mistakes and grows morally. Remember your ultimate goal is to wean your child from your guidance so he acts right on his own. Studies are very clear: kids who act morally have parents who expect them to do so. It sets a standard for your child’s conduct and also lets her know in no uncertain terms what you value. Post your moral standards at home then consistently reinforce them until your child internalizes them so they become his rules, too. Researchers tell us one of the best moral-building practices is to point out the impact of the child’s behavior on the other person. Doing so enhances a child’s moral growth: (”See, you made her cry”) or highlight the victim’s feeling (”Now he feels bad”). The trick is to help to help the child really imagine what it would be like to be in the victim’s place so she will be more sensitive to how her behavior impacts others. Kids don’t learn how to be moral from reading about it in textbooks but from doing good deeds. Encourage your child to lend a hand to make a difference in his world, and always help him recognize the positive effect the gesture had on the recipient. The real goal is for kids to become less and less dependent on adult guidance by incorporating moral principles into their daily lives and making them their own. That can happen only if parents emphasize the importance of the virtues over and over and their kids repeatedly practice those moral behaviors. Teach your child the Golden Rule that has guided many civilizations for centuries, “Treat others as you want to be treated.” Remind him to ask himself before acting, Would I want someone to treat me like that? It helps him think about his behavior and its consequences on others. Make the rule become your family’s over-arching moral principal. For more Parenting Solutions follow Michele at twitter @micheleborba or on her daily blog, Dr. Michele Borba’s Reality Check.